Think about the moment when your bartender twists that narrow strip of lemon or orange peel to garnish your cocktail. A tiny spritz of citrus oil bursts into the air, releasing the fruit’s aroma and brightening your mood. You’re experiencing not only the anticipation of the drink but also the effect of terpenes. Terpenes are the essential oils of plants, responsible for their unique aromas and flavors. Just as basil, citrus and lavender get their distinctive qualities from these organic compounds, so does cannabis. Lemon Haze smells citrusy because it contains the terpene limonene, which is also found in lemons, and other citrus fruits. Terpenes contain no THC, but they still can affect your state of mind—much like using essential oils in aromatherapy, Korkidis says. Limonene is a mood booster, for example, and linalool (also found in lavender) promotes relaxation. “We’ve had terpene cocktails on our menu since day one,” says Dave Whitton, a self-professed terpene devotee and owner of Prank in Los Angeles. The excitement of using terpenes to create fun flavor profiles is heightened by his belief that they also offer health benefits. “Terpenes are where the majority of the health benefits lie.” Some, like pinene, are considered anti-inflammatory, while caryophyllene is said to reduce anxiety. Whitton and Korkidis use cannabis-derived terpenes as well as steam-distilled ones from other plants, which are easier to find, less expensive (starting at around $14 per ounce) and have the same aroma and flavor profiles. Whitton works with a laboratory to create proprietary distillates, but similar, federally legal products are available online from companies such as True Terpenes and Terpene Botanicals. One of Prank’s latest seasonal cocktails, the Lazy Daisy, combines pink grapefruit, herbal gin, chamomile syrup and humulene, which has a hoppy profile. The terpene adds body to the drink, Whitton says, while softening the citrus. Korkidis is partial to limonene and linalool, especially for cocktails involving orange and lemon. 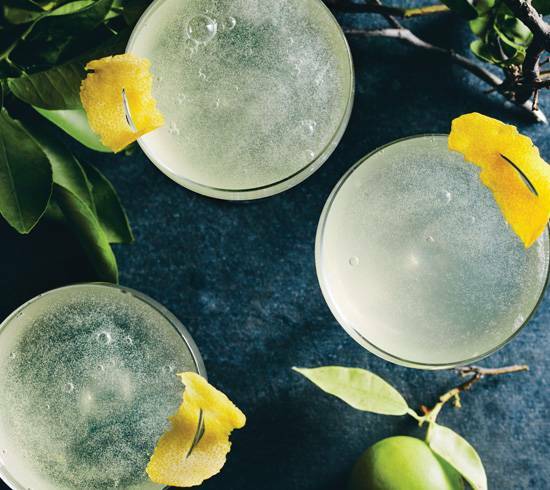 With lime juice and tequila, “you could use these to do a great version of a paloma,” he says. For a Meyer lemon cocktail, he recommends combining limonene with a light agave sweetener and a complex botanical gin. Blood orange is another great citrus option, paired with an herbaceous terpene such as pinene. Korkidis recommends using less than 0.25 ml for a single drink. “Since terpene concentrations and ratios can vary by supplier, it’s always advised to follow the manufacturer’s instructions explicitly,” he says. Whitton typically dilutes terpenes 3-to-1 or 4-to-1 with water or tea (the terpene is the lesser part of the ratio), depending on the cocktail he’s making. Caryophyllene: With notes of black pepper and baking spices, this is found in Rockstar and Skywalker OG cannabis strains. It has a calming effect; used to combat anxiety, pain and inflammation. Humulene: Common in White Widow and Girl Scout Cookies strains, hoppy humulene has earthy, woody aromas and herbal notes. It’s known for its anti-bacterial and anti-inflammatory qualities. Limonene: With a citrus profile, limonene is found in Lemon Haze, OG Kush and Tangle. It’s used to lift mood and relieve stress. Linalool: Found in the Lavender OG and LA Confidential strains, this terpene has floral aromas and promotes relaxation. Pinene: With notes of pine needles and herbs, pinene is found in Bubba Kush, Jack Herer and Trainwreck strains. It’s said to promote alertness and reduce inflammation. Myrcene: Earthy and sometimes skunky, myrcene is found in the Kosher Kush and White Widow strains. It’s used as a sedative, anti-depressant and sleep aid. For Tangie Sour recipe, tap here.